We’re comparing the Asus ROG Strix RTX 2080 ($870 on NeweggRemove non-product link) against GeForce RTX 2080 Founders Edition ($799 at Best Buy or GeForce.com) and RTX 2080 Ti Founders Edition ($1,199 at Best Buy and GeForce.com), of course. 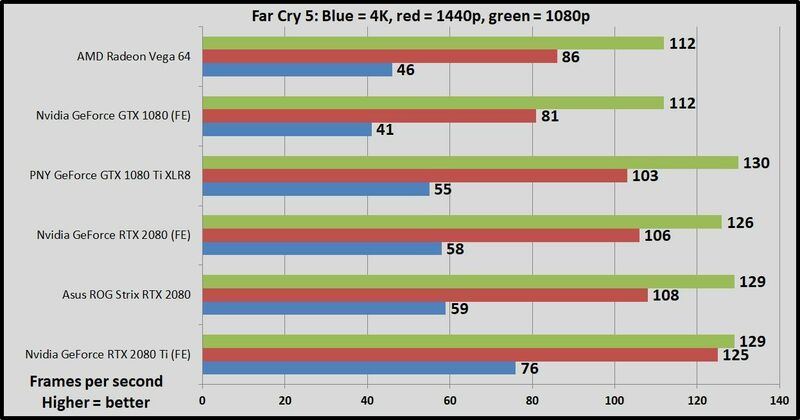 We’ve also tested its performance compared to the the GeForce GTX 1080 Founders Edition and PNY GeForce GTX 1080 Ti. 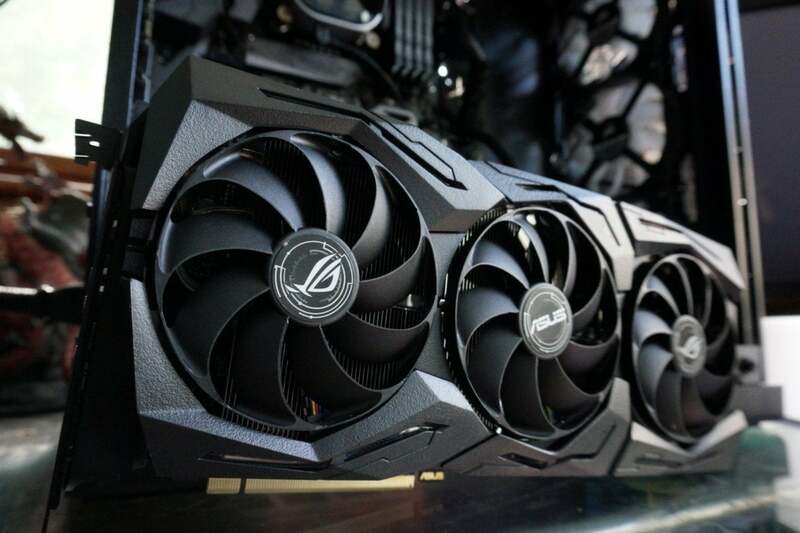 Neither of those are on sale any longer, but you can find other customized GTX 1080s starting around $470 on Newegg, and custom GTX 1080 Tis starting around $700 on Newegg. Finally, to give the Red Team some representation we’ve included the results from the Radeon RX Vega 64 reference card, AMD’s most potent GPU. Custom Vega 64 models start around $500 on Newegg, though most sell for $550 or more. Each game is tested using its in-game benchmark at the highest possible graphics presets, with VSync, frame rate caps, and all GPU vendor-specific technologies—like AMD TressFX, Nvidia GameWorks options, and FreeSync/G-Sync—disabled, and temporal anti-aliasing (TAA) enabled to push these high-end cards to their limits. If anything differs from that, we’ll mention it. The following benchmarks results were taken using Performance mode, the default configuration for the Asus ROG Strix 2080. We’ve tested the card’s Quiet and OC modes as well, though and wanted to share some quick comparisons and thoughts for each. 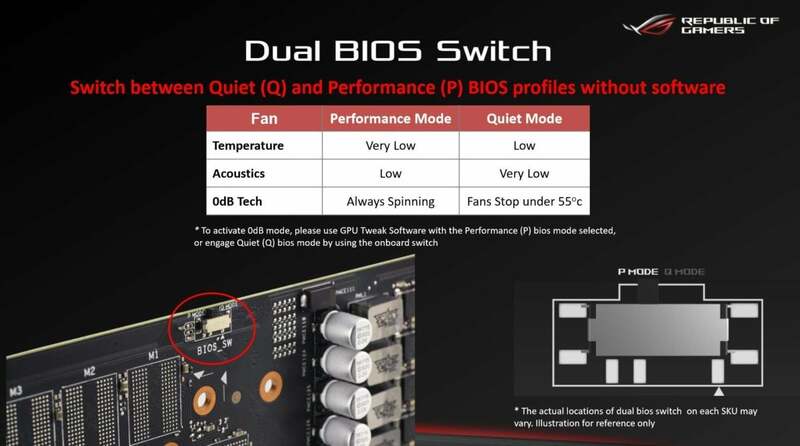 Quiet mode benchmarks are identical to Performance mode’s, within a margin of error. Only temperatures and noise levels differentiate the two. We’ll dive more deeply into those differences in the thermal and acoustics section later in the review. We didn’t test with the Asus OC mode for a couple of reasons. 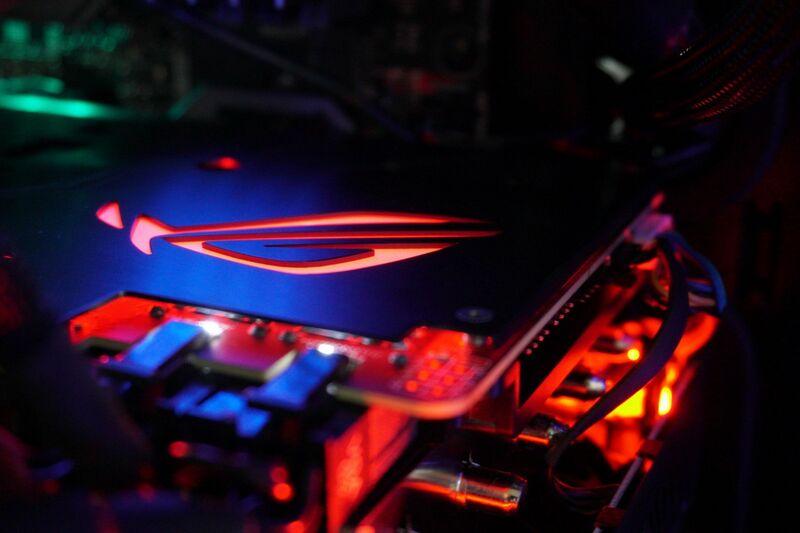 First of all, activating it requires downloading the separate Asus GPU Tweak II software, which many users may not do. Second, the 30MHz it adds doesn’t equate to any real additional performance in games. 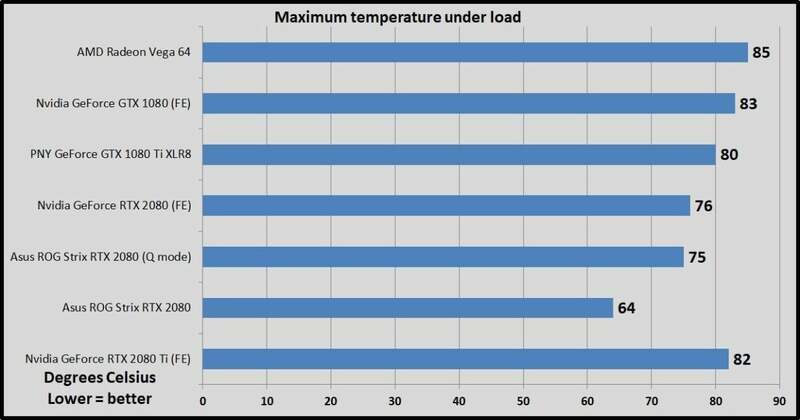 Overclocking RTX graphics cards is a bit tricky overall, actually. While you can indeed approach or break the 2,000MHz barrier often, the cards don’t necessarily run at full clock speeds at all times. 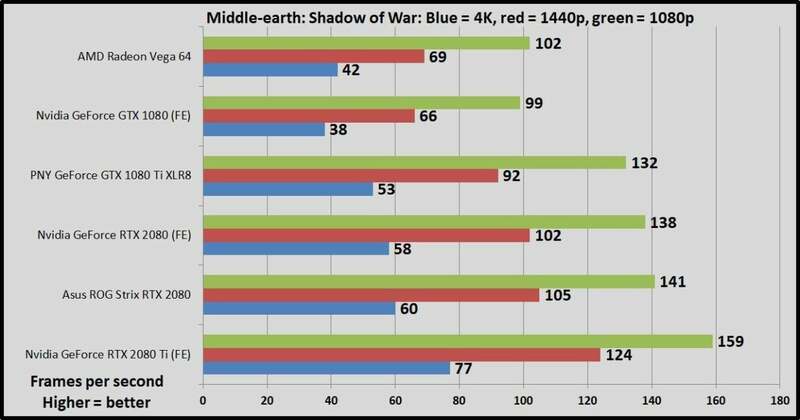 Instead, Nvidia’s imposed power and voltage limits often ramp down performance in more demanding titles and scenes. 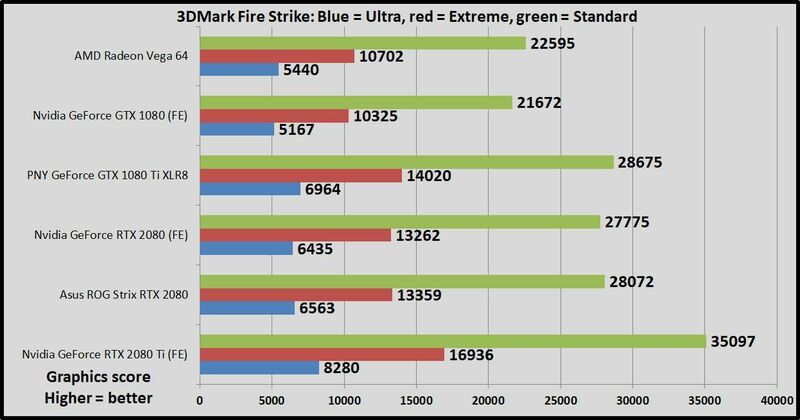 You might be able to hit 2,000MHz in your overclocking software, and see a performance uplift in synthetic benchmarking tools like Fire Strike or Unigine Heaven, but we’re not seeing many additional frames per second in actual games even with power, temperature, and voltage raised to the maximum. 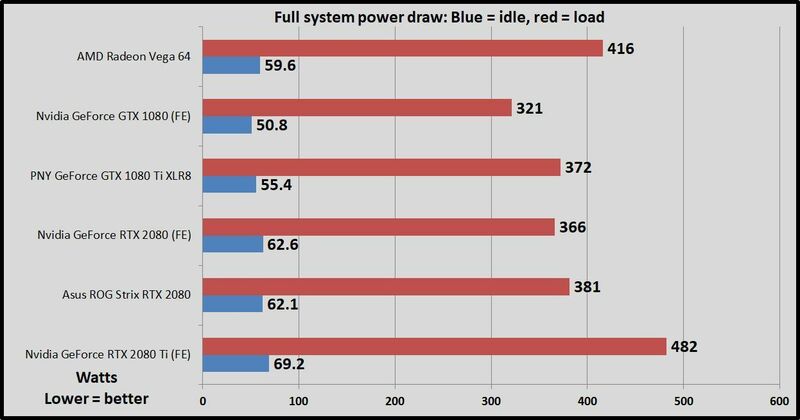 The power limit holds performance back, not the raw maximum clock speed. 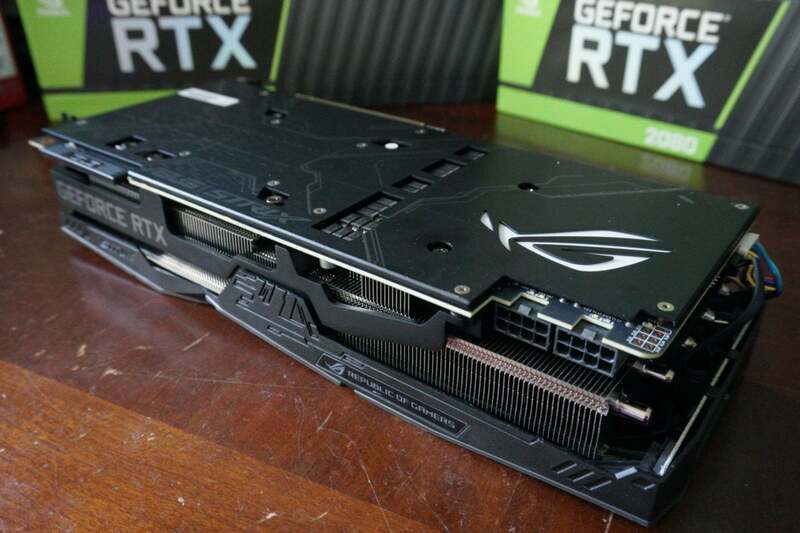 Adding insult to injury, Nvidia lets you boost the RTX 2080 Founders Edition’s power limit by 23 percent. 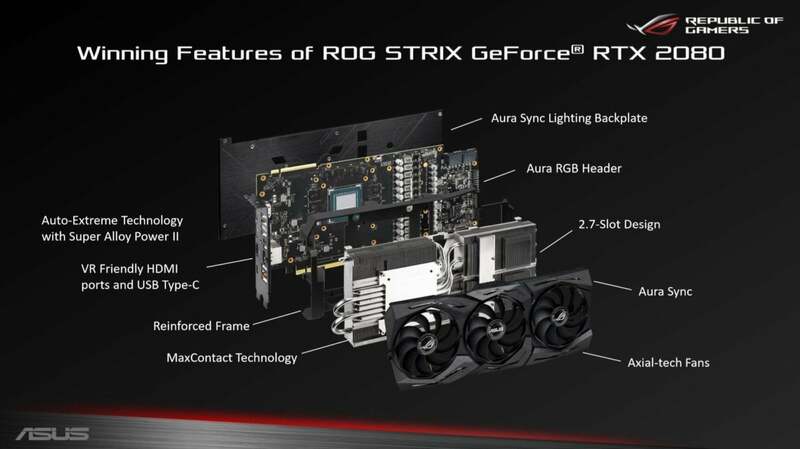 Asus lets you raise the ROG Strix RTX 2080’s power limit by 25 percent. Again, Nvidia’s homebrew graphics cards are competing hard with the customized partner options. 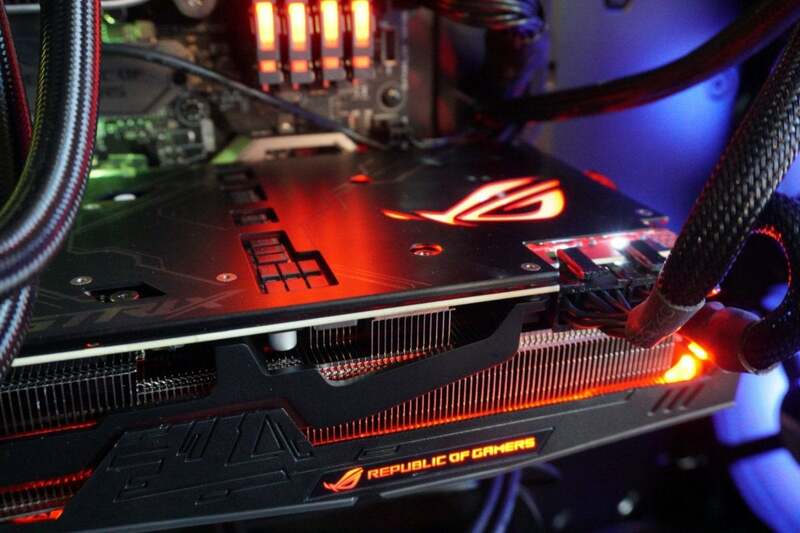 Our ROG Strix review sample lost the silicon lottery regardless. After applying OC mode, we were only able to add another 60MHz in manual overclocking, topping out at 1,950MHz. That’s well above the RTX 2080’s 1,710MHz reference boost clock, but below the 2,000MHz-plus we’ve seen on some other RTX GPUs. Let’s kick things off with Strange Brigade ($50 on Humble), a cooperative third-person shooter where a team of adventurers blast through hordes of mythological enemies. It’s a technological showcase, built around the next-gen Vulkan and DirectX 12 technologies and infused with features like HDR support and the ability to toggle asynchronous compute on and off. It uses Rebellion’s custom Azure engine. We tested DirectX 12 with async compute off, as it traditionally only boosted Radeon GPUs, though the RTX 20-series makes huge gains in those regards thanks to its revamped GPU architecture. We’ll likely enable the feature in future tests. The gains amount to only a couple of frames per second in this game, though. 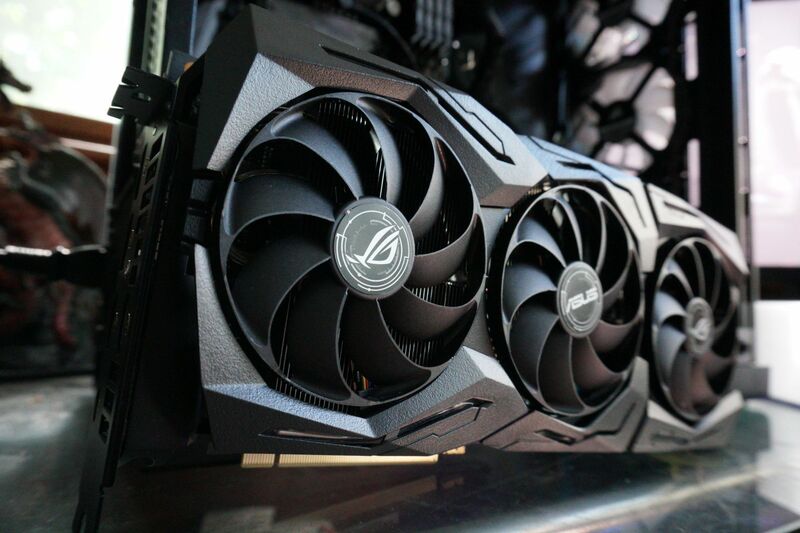 The Asus ROG Strix pulls ahead of the Nvidia RTX 2080 Founders Edition by a few percentage points across all resolutions, a trend you’ll see across the board in our test suite. 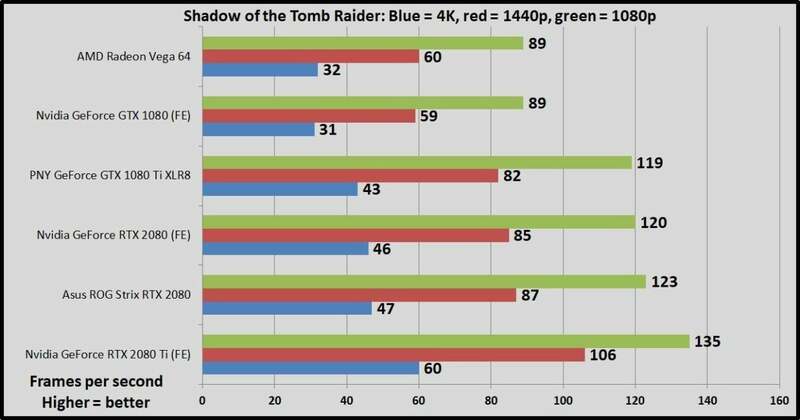 We’ll mostly let the games benchmarks speak for themselves because of that. 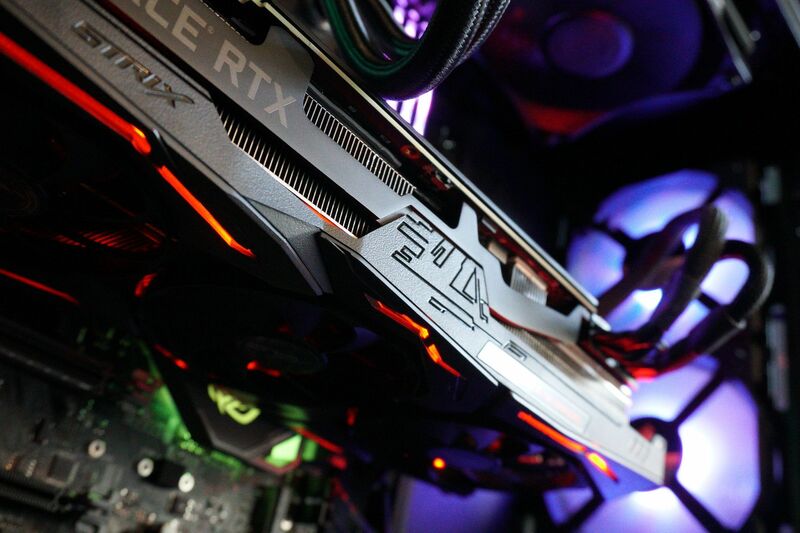 For a more in-depth analysis of how the RTX 2080 compares against its rivals and predecessors, be sure to read our GeForce RTX 2080 and RTX 2080 Ti review. Shadow of the Tomb Raider ($60 on Humble) concludes the reboot trilogy, and it’s utterly gorgeous—so much so that even the state-of-the-art GeForce RTX 2080 Ti barely manages to average 60 fps with all the bells and whistles turned on at 4K resolution. Square Enix actually optimized this game for DX12, and only recommends DX11 if you’re using older hardware or Windows 7, so we test with that. Shadow of the Tomb Raider uses an enhanced version of the Foundation engine that also powered Rise of the Tomb Raider. Finally, a DirectX 11 game! Far Cry 5 ($60 on Humble) is powered by Ubisoft’s long-established Dunia engine. It’s just as gorgeous as its predecessors—and almost even more fun. The game also supports HDR. More on that later. Move over, Crysis. 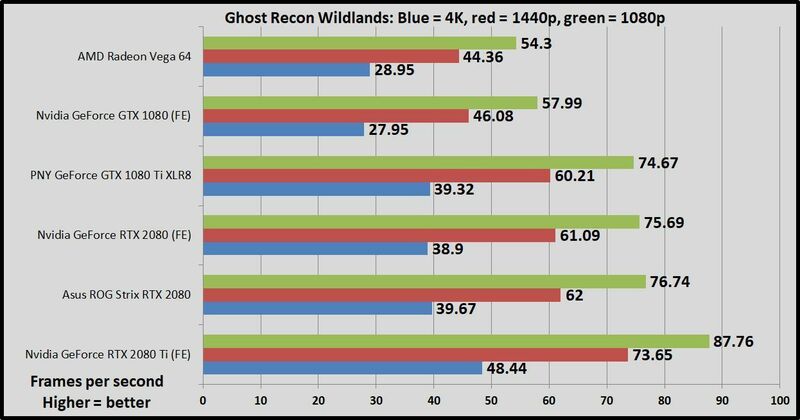 If you crank all the graphics options up to 11, like we do for these tests, Ghost Recon Wildlands ($50 on Humble) and its AnvilNext 2.0 engine absolutely melts GPUs. 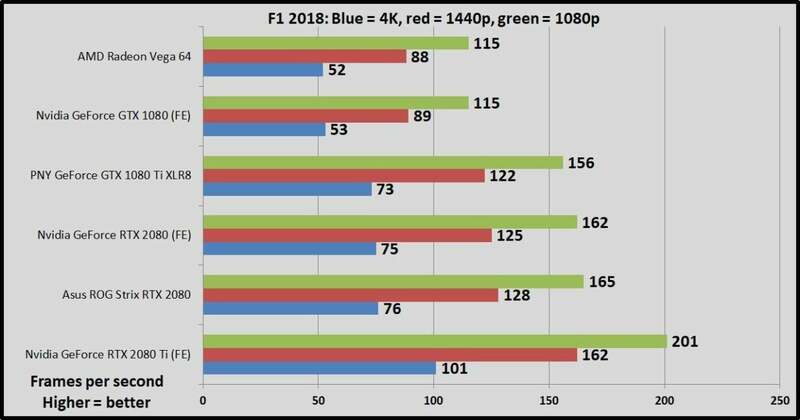 Even the GeForce RTX 2080 Ti can’t come close to 60 fps at 4K resolution. 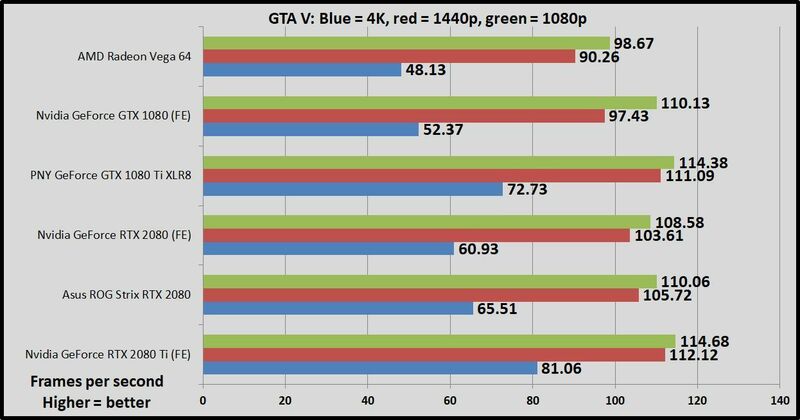 Dropping the graphics settings down to Very High or High greatly increases performance, but we don’t do that in our testing. Middle-earth: Shadow of War ($50 on Humble) adds a strategic layer to the series’ sublime core gameplay loop, adapting the Nemesis system to let you create an army of personalized Orc commanders. It plays like a champ on PC, too, thanks to Monolith’s custom LithTech Firebird engine. The latest in a long line of successful games, F1 2018 ($60 on Humble) is a benchmarking gem, supplying a wide array of both graphical and benchmarking options—making it a much more reliable option than the Forza series. It’s built on the fourth version of Codemasters’ buttery-smooth Ego game engine. We test two laps on the Australia course, with clear skies. 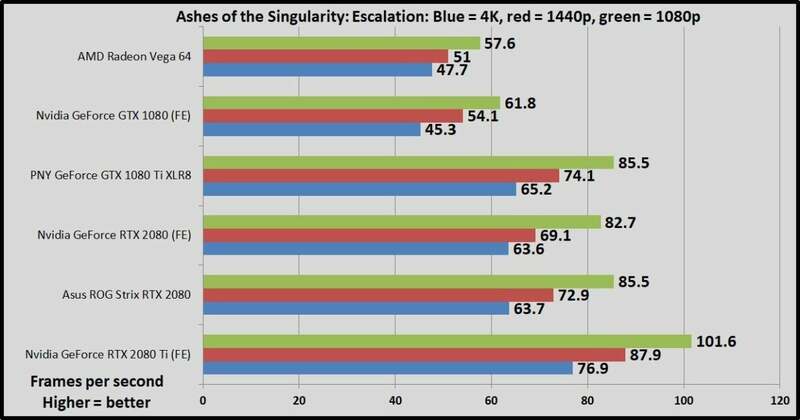 Ashes of the Singularity ($40 on Humble) was one of the very first DX12 games, and it remains a flagbearer for the technology to this day thanks to the extreme scalability of Oxide Games’ next-gen Nitrous engine. With hundreds of units onscreen simultaneously and some serious graphics effects in play, the Crazy preset can make graphics cards sweat. Ashes runs in both DX11 and DX12, but we only test in DX12, as it delivers the best results for both Nvidia and AMD GPUs these days. Surprise! The GeForce GTX 1080 Ti is faster than the newer RTX 2080 in GTA V.
Finally, let’s take a peek at Rainbow Six Siege ($40 on Humble), a game whose audience just keeps on growing, and one that still feels like the only truly next-gen shooter after all these years. Like Ghost Recon Wildlands, this game runs on Ubisoft’s AnvilNext 2.0 engine, but Rainbow Six Siege responds especially well to games that lean on async compute features. That’s why it performs so much better on Vega 64 and the RTX 20-series cards compared to the older GTX 10-series GPUs. We also tested Asus ROG Strix RTX 2080 using 3DMark’s highly respected Fire Strike synthetic benchmark. 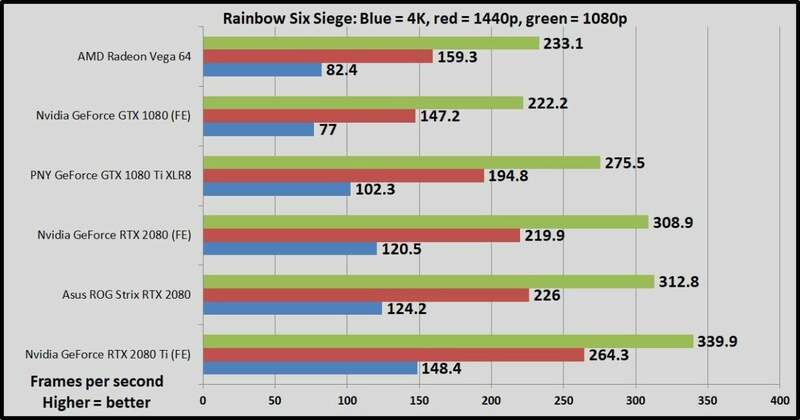 Fire Strike runs at 1080p, Fire Strike Extreme runs at 1440p, and Fire Strike Ultra runs at 4K resolution. All render the same scene, but with more intense graphical effects as you move up the scale so that Extreme and Ultra stress GPUs even more. We record the graphics score to eliminate variance from the CPU. As you’d expect, the slightly higher-clocked ROG Strix earns a slightly higher Fire Strike score in all versions of the test. Look at those temperatures. 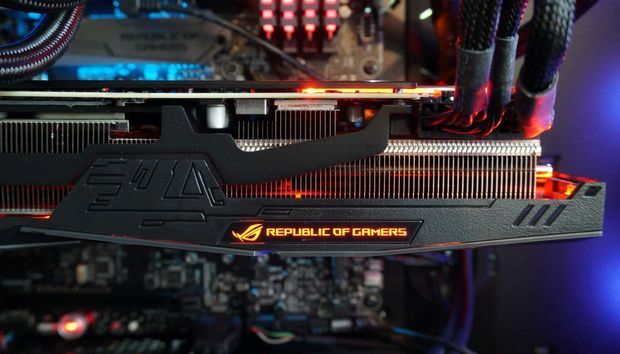 In its default Performance mode, the Asus ROG Strix RTX 2080 is ice-cold. That’s the power of heavy metal. But I wish the quiet mode were the default instead of the secondary option. 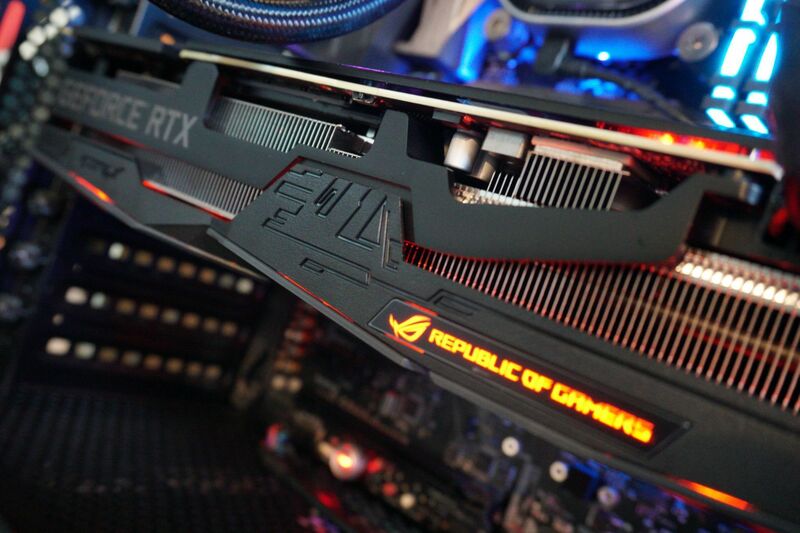 The ROG Strix hits those 64-degree-Celsius temperatures at roughly the same noise levels of Nvidia’s RTX 2080 Founders Edition—which, admittedly, isn’t too loud. 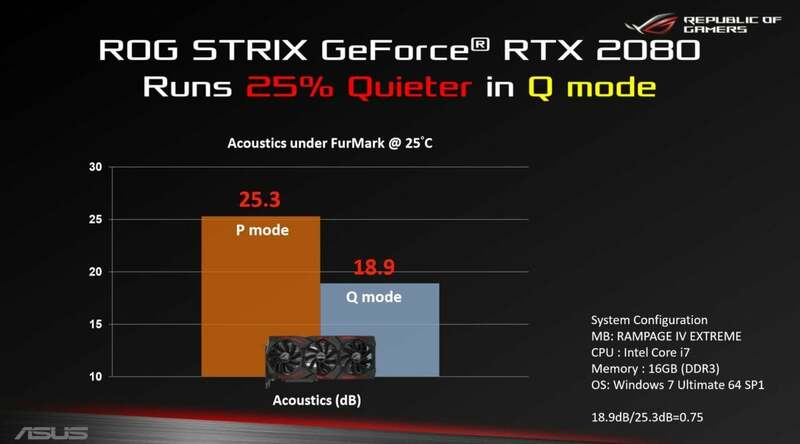 But in Quiet mode, the ROG Strix delivers the same performance while running virtually silent. I’ve never heard a high-performance, air-cooled graphics card run this quietly. The idle fan when the GPU is below 55 degrees continues to be a very welcome feature when you’re hanging out on the desktop instead of gaming. 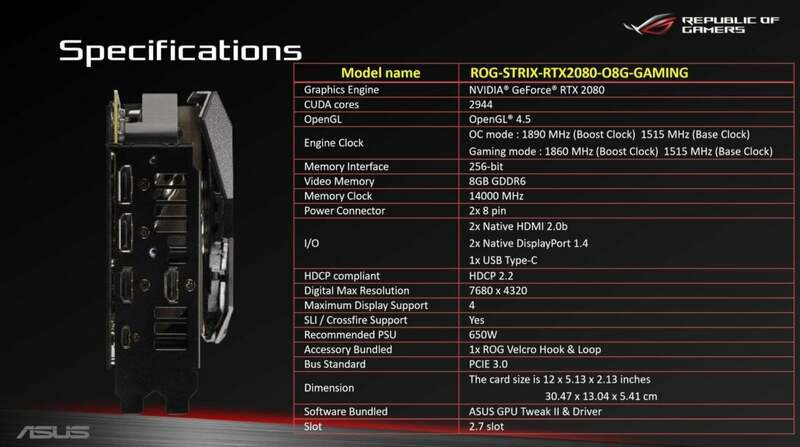 Next page: Should you buy the Asus ROG Strix RTX 2080?